Transsexual activist Mariah Lopez has gotten the Manhattan D.A.’s office to assign someone to look more closely into the death of NYC icon and transgender activist Marsha P. Johnson whose body was found floating in the Hudson River off the West Village Piers shortly after the 1992 LGBT Pride March. 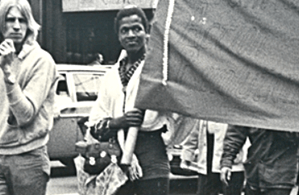 One of NYC’s best known and loved figures of the LGBT revolution Johnson was a leader in clashes with the police amid the Stonewall Riots and was a co-founder, along with Sylvia Rivera, of Street Transvestite Action Revolutionaries (S.T.A.R.) in the early 1970s. She also was the “mother” of S.T.A.R. House along with Sylvia, getting together food and clothing to help support transgender youth and lesbian and gay kids both living in the house on the lower East Side of New York and at the piers on the Westside highway. Police originally ruled Marsha Johnsons death a suicide. But Johnson’s friends and supporters said she was not suicidal, and a people’s postering campaign later declared that Johnson had earlier been harassed near the spot where her body was found. Attempts to get the police to investigate the cause of death were unsuccessful until now 21 years later. Ms. Lopez is also pushing for a permanent tribute statue of Marsha P Johnson by the Christopher Pier which would be a wonderful homage to one of NYC’s first and most loved Stonewall era icons. GLADD Releases New Study, LGBT’s Are Underrepresented In Movies. DUH!